– May 11, 2012Posted in: The Premiere! We have a star in our midst. 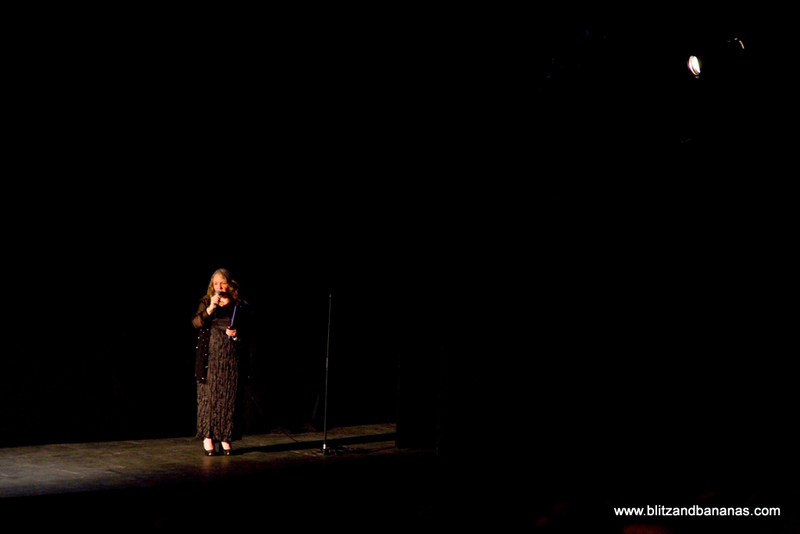 It was quite wonderful to hear the tremendous cheer that Anna received when she climbed onto the stage at the end of the first showing of BLITZ AND BANANAS in the Churchill Theatre on April 1. The applause was very loud, very prolonged and richly deserved. I was filming through my XM2 from the balcony and as she turned to face the clapping, she was noticeably knocked off her stride by the sustained noise. The applause lasted long enough to give the teary among us time to get back our self control. In my case to be able to see through the viewfinder again! Let’s face it, we’d witnessed something extraordinary. We’d just seen most of the (unwritten) rules about amateur film making being totally pulverised in style. Our hobby has its own version of the saying that you must learn to walk before you try to run. There are whole cemeteries given over to the bones of madly ambitious projects to ‘make a real film’ that never even made it to the shooting stage. A slightly smaller graveyard is reserved for projects that started well, but fell apart over clashes of personality. The body count in ego wars is high. The biggest cemetery of all is for those completed films that really didn’t add up to a row of beans, through a lack of any kind of audience appeal. Over in the corner, there is a tiny, very exclusive cemetery with only a short row of neat headstones. It’s where they lay to rest a rare breed; the amateur films produced by rare individuals who get a bee into their bonnet and devote all their talents to pushing it through to their goal – enchanting an audience with the magic of their movie. Anna didn’t seem to be paying attention. Yes, she made a very effective 6 minute film about a world weary young girl, but then she leapt clean over the next twenty stages by challenging herself to make a feature length next. The only connection between her two films, is that the actress who played the young girl, is also a key player in Blitz and Bananas. Anna coped with, and certainly didn’t succumb to the pressures of such a huge task, made all the more imposing when one considers that to the technical difficulties – there’s the fact that nobody “working” is being paid for their input. Nobody can be fired and everyone giving up that rarest commodity – their time. They’re either working or fitting in with other family members’ hobbies and they probably have a partner to placate, humour and live with! Anna’s film would have been terrific if she’d only done one of the major “jobs” writing it, directing it, acting in it, being props finder, the location finder, or had been the producer, the one who makes EVERYTHING happen in a planned way. Instead Anna did all these tasks, from setting the ball rolling with her request for members’ War time experiences, collating and sifting them to establish the several story threads that she wove into the original script. She saw a way to go, and set about getting there with a gusto which has been barely credible. She stuck to the task in a heroic way, so robust in her determination, yet so flexible in getting such much cooperation from so many people, including Brian Murphy and his wife as performers. She also worked miracles in getting help from one and all as well as so gently coaxing so many wonderful performances out of her child actors. They will suss you in a second and the kids’ loyalty to, and acceptance of Anna alone is a tribute to her personality. As well as directing everyone else through their performances, she also played a key character, the solid unflappable (dare I say, Northern ) house keeper who makes the posh lady’s household function come what may, while coping with the worry of having her fireman husband away in London in the Blitz itself for several days. The best was the weatherman’s forecast of a cold overcast day! 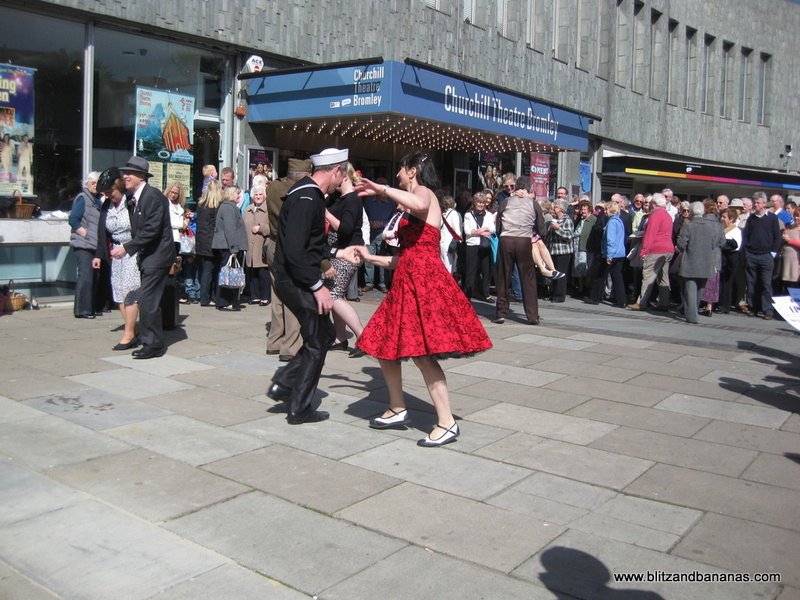 It turned out to be maybe the last of the glorious spring days, so we went up to Bromley to join the crowd being entertained outside the Churchill by some jitter-bugging dancers from Hextable, in WWII outfits that including a fetching US sailor that Anna had laid on. 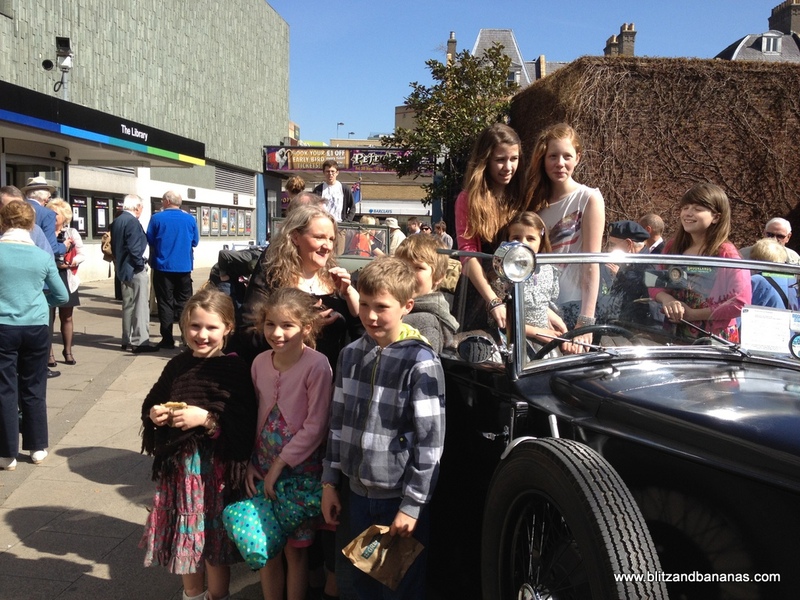 They were joined by three vehicles, two Jeeps and an MG of WWII vintage which paraded up the precinct carrying the child stars. The full house audience streamed in to view WWII memorabilia laid out in the Foyer where Peggy, Jo and Nellie were dispensing soft drinks and Annabelle and Pat P. Roger and Brenda W. were flogging raffle tickets like hot cakes. In the theatre the audience were greeted by a screen 7 metres wide. Mild panic for me. Would the standard def pictures really manage to fill that size? No worries, back- stage a huge Panasonic 10,000 watt projector was revving up quietly.